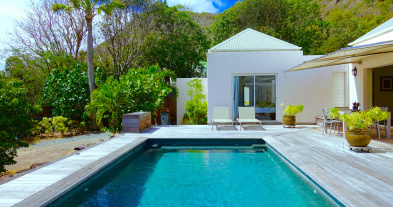 Villa Habitation Saint Louis is perfect for a family or a group of friends looking for a private villa, only 2 minutes walk from the beach. 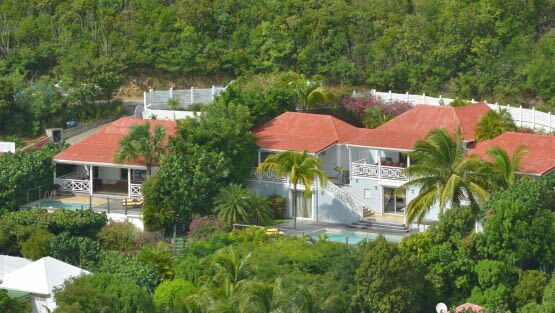 This 4 bedroom villa on the hillside of Corossol offers a magnificent panoramic view over the bay and the ocean. 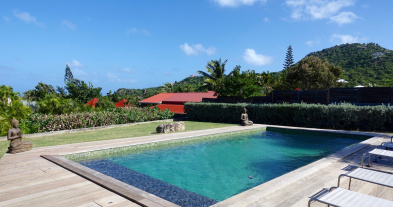 Villa Habitation Saint Louis located in Corossol is an authentic 4 bedroom St. Barts house close to the beach and a few minutes from the shops. 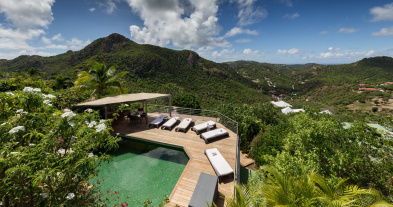 This private villa on a hillside offers a view of the sea and the port. The villa is built on 2 levels. On level 1 is the living room, furnished in Indonesian style and open to the terrace with sea view. A breakfast bar separates the living room from the well-equipped kitchen. The covered terrace is located next to the living room and kitchen with dining room and outdoor living room. 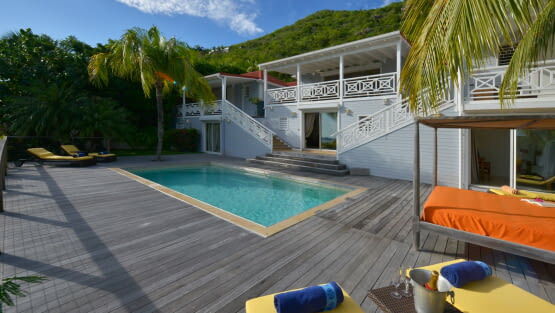 On the same level there are 2 bedrooms, each with en suite bathroom and open to the poolside overlooking the bay. One of the bedrooms has a double or twin beds, while the second bedroom has a queen-size bed. The upper floor has 2 bedrooms, each with a double bed, an adjoining bathroom and a large private terrace with a view. On the large terrace there are deckchairs and a large daybed surrounding the pool, the ideal place to read by the pool or sunbathe. Lush tropical gardens surround the property. A private path leads from the villa to the beach. 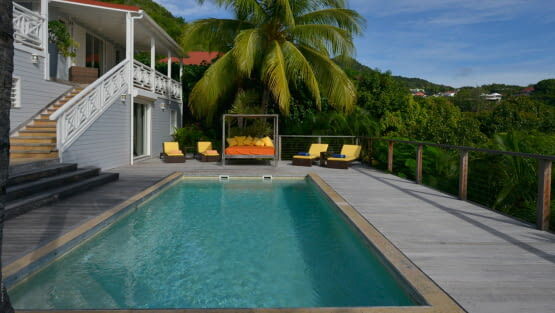 Villa Habitation Saint Louis can be rented with the neighbouring villa, Petit Saint Louis, for a total of 5 bedrooms. The two villas are rented together during the Christmas/New Year period. Table with seating for 8 guests on the covered terrace. Ocean view. 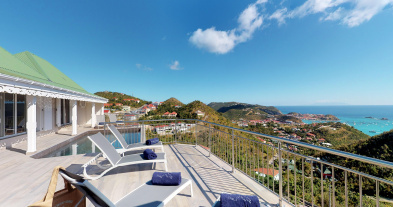 Large terrace surrounding the pool, offering an amazing view of Corossol Harbor and the sunset. Nice swimming pool with splendid view. Splendid tropical garden surrounding the villa.